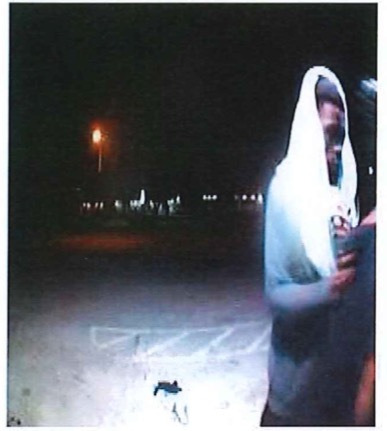 Please check out the video below and contact Detective Barton at (214) 671-3584 if you have any information about the suspects involved in this offense. You may also contact Crime Stoppers. Crime Stoppers will pay up to $5000.00 for information called into Crime Stoppers which leads to the arrest and indictment for this or other felony crime. If you have information about this crime, please call 214-373-TIPS. On September 30, 2017, at approximately 2:40 a.m., the victim was forced by two black male suspects, at gunpoint, to remove money from an ATM machine located at 402 E. Wheatland Road, in Duncanville. The suspects then had the victim drive her vehicle and park behind a building at 7221 American Way, in Dallas, where a third suspect joined them. All three suspects then sexually assaulted the complainant before fleeing from the location on foot at approximately 4:50 a.m.
One of the suspects is pictured above. The three suspects were all described as being black males, between 17 and 24 years of age, of average height and build. If you have any information regarding the vehicle or the person of interest, please contact Crimestoppers. Crimestoppers will pay up to $5000.00 for information called into Crimestoppers which leads to the arrest and indictment for this or other felony crime. If you have information about this crime, please call 214-373-TIPS. On September 30, 2017 at about 5:12 a.m., Dallas Police officers responded to a call regarding a sexual assault in the 7200 block of American Way. The victim told officers she was approached by two Black male suspects while she was at the ATM in the 400 block of E. Wheatland Road in Duncanville. One of the suspects threatened the victim with a gun and both suspects entered the victim’s vehicle. The suspects forced the victim to drive to the 7200 block of American Way where she was sexually assaulted. At some point a third suspect, also described as a Black male, met up with the other two suspects at the offense location and then sexually assaulted the victim. The suspects then took property from the victim and all three suspects fled the location on foot. Dallas Police and Duncanville Police are working together to identify and capture the suspects involved in this offense. Detectives are seeking the public’s assistance in gathering information about the identity of these suspects. If anyone has any information about this case, they are asked to please contact Detective Barton at (214) 671-3584.